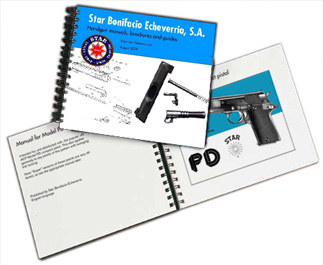 All the handgun manuals available to me now have been gathered into a large document, and are now available for you to take home in printed form. This is a soft-cover document, available in your choice of color or black and white (at a significant discount) and with a convenient spiral binding to allow it to lay flat, without being damaged. Aside from the added convenience to you, a small fee from the sale of each one goes towards the upkeep of this site. Don't worry, I'm not getting rich off this, at all. NEW!Both the Fi-Garcia manual for the Model D and the new low-res Megastar manuals are not yet included in the printed manual. If you need these, ask me and I'll get around to updating the files. Each of the manuals available in the printed version above are also available as a free, downloadable file. Most of these are PDFs. You can print these yourself and use them as you want. They are not even reduced in quality from the printed copies or anything. Even more than in other series, these pistols are essentially identical. Some vary only in caliber. The "Super" variant is a significant change, but also applies to all lettered models. Fi-Garcia (Importer) D Manual, English (2mb PDF) NEW! Megastar Manual, English low-resolution scan (1.1mb PDF) NEW! See relevant semi-automatic pistol series for basic stripping. Some manuals or other instruction sheets contain inaccuracies. In theory, these would have been corrected in future versions of the printed manuals and you'd be contacted about them, But Star doesn't exist, so it's up to me. They may or may not be corrected in the downloadable manuals I have put together, due to the extra effort and since the provided manuals are just pure reproductions of what existed, so have both historical and functional value. All corrections will be listed here. On Super pistols, the loaded chamber indicator must be removed before the firing pin retainer. On some Star pistols, notably the Firestar series, it's moderately common to get the takedown pin inserted improperly, so that the gun will not function and cannot apparently be stripped again. Reader Jeffery Simmons documented his solution to it and has shared it. Hold the trigger and hammer both fully to the rear. While this is happening (get a helper if you need) pull the slide back while lightly pushing the takedown pin right to left until it goes back far enough it comes out and remove the slide as normal.